Attorneys, judges and other legal professionals often have incomes that exceed the limits of the traditional insurance markets; therefore people in the legal profession are usually underinsured. Being underinsured can be just as dangerous as not being insured at all. 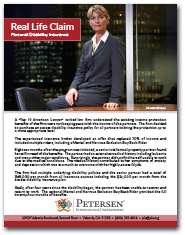 Petersen International Underwriters’ Legal Profession Disability Insurance Plan was developed to help your clients secure sufficient coverage in case a disability inhibits them from working. Mr. Q, esq. is a preeminent trial lawyer with an income in the seven figures. His life style is also in the seven figures so a disability would create a real financial problem. The $10,000 per month of IDI and the $25,000 per month group LTD would not come close to covering his monthly expenses. His needs were met by Petersen International Underwriters issuing him $75,000 per month additional disability coverage. In addition to the jumbo size of monthly benefit the policy recognized his specialty within the legal profession as a litigator/trial attorney. 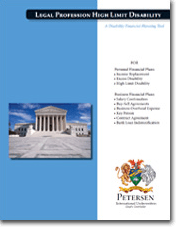 Recognizing that this industry has many specialties, the Legal Profession Disability Plan is customized for the difference between trial attorneys and business or civil attorneys as well as judges. This provides an own occupation definition which is incredibly beneficial for a person practicing a specialized portion of the law. If your clients working in the Legal Industry are not satisfied with their current amount of income replacement insurance, PIU’s Legal Profession Disability Plan will solve the problem. PIU will be happy to assist you by providing the information you need to know to make the sale. We will help you expertly explain income replacement options to your clients allowing them to secure adequate amounts of disability insurance. Click the image to download a Real Life Claim story.